Just one of my favorite porch memories. On the Atlantic in North Carolina. The view from our front porch on a spring day. 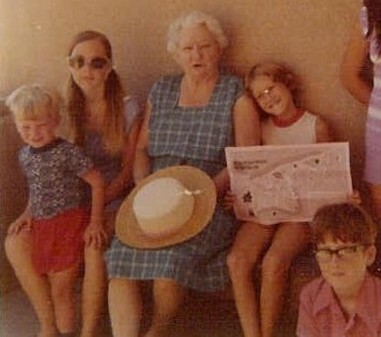 This time and place has not been identified yet, so allow me: In Carlsbad, New Mexica, circa 1973. L-R: 3-year-old Eddy Herbert, 12-year-old Melinda Herbert, Grandmama Vera Herbert (a saint and 78 years old in this photo), 9 year old Letha Lyons, 11-year-old Steven Lyons. Grandmama Herbert could be counted on to arrange, and participate in, as many fun outings as the kids could handle. The kids always played-out before she did! RIP Vera. 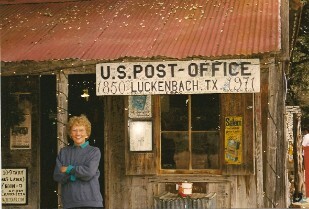 WE don't HAVE to go to Luckenbach, Texas to BE somebody, but it's fun to stop there now and then. 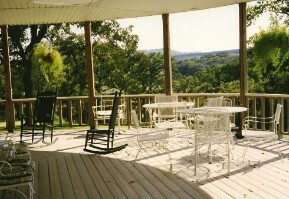 The porch at The Haven is the birth place of our local writers' group, Hill Country Women of Words, in 2001. They celebrated WOW's 17th birthday in July 2018! Way to go WOW's ! 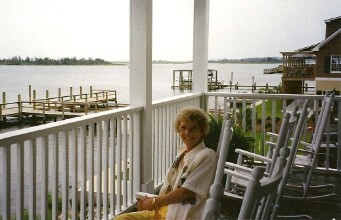 On Carolyn's porch where she unknowingly introduced me to my new life as an Eberle! ... and a summer view from my back porch. 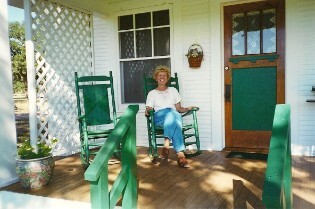 My favorite porch of all: our own front porch with Dear Heart, in our rocking chairs, with my knitting, and the Laura Bush petunias in bloom.